For the first time in NFL history, four NFL games will be played in London, starting with the Jaguars vs. Ravens (-3.5/39) on Sunday morning at 9:30 a.m. ET. CBS will only broadcast the game locally for those in the Baltimore and Jacksonville markets, but you can stream it for free here. Let’s dive a little deeper into the previous games played in London in order to identify any insightful betting trends to consider for this weekend and beyond. In a sample size of a little over two full seasons, NFL teams are a shocking 11-22-1 ATS (33 percent) the week before traveling to London, including the Jaguars and Ravens 1-1 ATS record from last week. As with any trend, I don’t find simple correlation meaningful without causality. Are teams looking ahead to London? …distracted? …preparing differently? If you can identify a valid reason for this trend that has cashed at a 67 percent clip over the past 10 years, then you should look hard at both Panthers -6 and Jets +7 this weekend, as both travel to London next week. One might speculate that fading teams the week after London would make more sense given the added travel. However, the 2016 Colts remain the only team (of 34) to not have a bye following a trip to "The Smoke." A few teams playing in London this year actually don’t have a bye the following week. As a reasult, I will monitor the "hangover" effect that may be worth considering in the future. 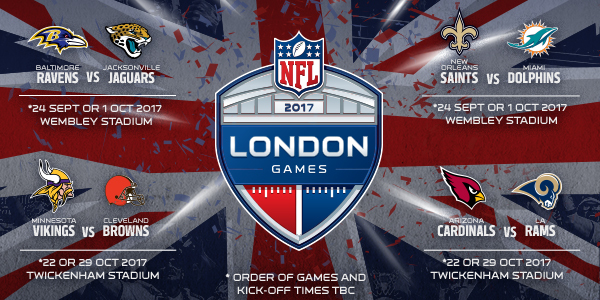 Three teams (Ravens, Browns, Cardinals) make their inaugural trips to London this season. British fans of the Eagles, Packers, Seahawks, Titans, Panthers and Texans must wait for another year to see their team at Wembley. Of the 23 teams that have played in London, only eight have done so multiple times. Six have made the trip twice (Patriots, Giants, 49ers, Lions, Rams, Bucs), and the Dolphins have done it on three separate occasions. The Jaguars, making their fifth trip this week, have the most London experience. They lost their first two trips in 2013 and 2014 by a combined 46 points, but have since covered two in a row, winning both outright as small underdogs in 2015 and 2016. Jacksonville’s results are promising for those who claim that gaining experience in London holds value. However, we simply don’t have a large enough sample size to properly rate experience, as only nine previous London games have featured an experience mismatch. The more experienced team covered five of those nine games – a statistically meaningless result. I will certainly continue to monitor the effect of experience, especially as the NFL continues to increase the number of games played overseas and even considers potentially starting a new team in London.